In this activity, students will consider the personal experiences of those who arrived on the ramp at Auschwitz-Birkenau. They will explore images from the Auschwitz Album, showing the arrival of Hungarian Jewish men, women and children in 1944, as well as listen to survivors who endured a similar process. 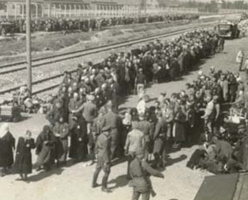 By completing this activity, students will analyze photographs as a primary source, learn how testimony can be used to analyze other primary sources and will be introduced to the Auschwitz Album and its historical context.